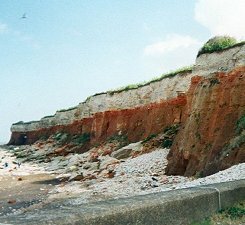 One of the curiosities about the North Norfolk coast path is that it doesn’t really start or finish anywhere, and this can be a little disconcerting. Turn up on the seafront at Minehead these days and you’ll find a bloody great sculpture and a National Trail acorn symbol painted on the tarmac. This last is so big you couldn’t miss it in the worst of Bristol Channel nor-easters. Even in the bad old days there was a brown tourist sign – displaying a total distance that was out by 130 miles, but the thought was there. Pop along to Hunstanton and you find yourself wandering past a fine series of seaside attractions – amusement arcades, municipal gardens, cliffs – but never a thing to indicate that you’re at the start of a national trail. At least, this is how it was last time we set out to walk it. Someone’ll probably tell us if anything’s changed. You just have to have a bit of faith, get the sea on your left and start walking. The mood starts to shift as Old Hunstanton approaches. Suddenly you find yourself in a small seaside village instead of a big seaside town and dunes take the place of the famous striped cliffs. The path isn’t always straightforward to find – you have to dodge between some sheds then up the side of a golf course – but the walker is rewarded by a great sense of actually having got under way, of finally attacking the task in hand. 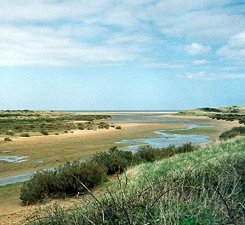 And you don’t have to wait very long before being confronted with as fine an example of the bleak, wonderful Norfolk landscape as your heart could desire – Holme Dunes, a national nature reserve that is extraordinarily rich in plant, bird, animal and insect life. It was also here that the Seahenge ancient monument was uncovered, and controversially removed. 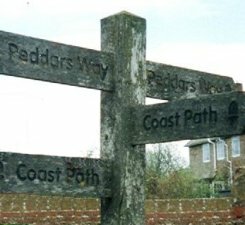 Your next landmark is passing the top of the Peddars Way (here, now the national trail is all official-like, you do get a neat little fingerpost for orientation purposes) before heading towards Gore Point, a somewhat isolated but very beautiful sandy headland. Sections of the trail are now boardwalked to overcome the fact you are crossing extremely soft sand. Here you’ll get your first glimpse of another phenomenon which occurs several times along this trail – pine woods just behind the shore line. Don’t worry if it’s all beginning to seem like a bit of a slog, however. Just off to your right, and very handy for the path, is the village of Thornham. This is now deepest Nelson country, so all the pubs have a nautical theme and every second one is called ‘The Local Hero’. But this has no bearing on the quality of their beer which we have found to be excellent on two separate occasions now. Our hot tip, as former Norfolk residents, is definitely to opt for the Woodforde’s if it’s on. Wherry and Nelson’s Revenge are the top picks, but you may feel it wise to stick to halves, particularly if it’s a hot day and your final destination is a few miles off. 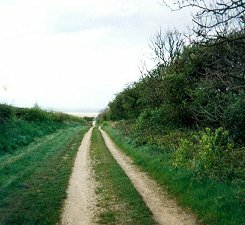 With Thornham and lunch behind you, be prepared for the path to do something a little unexpected and frankly rather irritating. There’s no coastal access between here and Brancaster, which is a bit of a disadvantage for a coastal footpath. And the alternative as provided really isn’t very prepossessing at all. Instead of a nice, cool walk along a breezy seashore that’s taking you directly where you want to go, you can either risk life and limb on an A-road (not recommended) or slog round three sides of a square, going uphill along tarmac roads (and Norfolk is rather more hilly than they let on, in places), down dusty agricultural tracks and round field edges. This isn’t necessarily what the coastal walker signed up for and it can prove extremely demoralising. 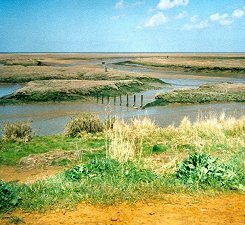 But it does at least have the advantage that you make very visible progress and, when you arrive in Brancaster, there are some shady benches for a sit-down and opportunities to buy refreshments. Our brothers and sisters who like to put 20-mile stretches under their belts will probably be pressing on for Wells now. But we feel this path deserves to have a little more time spent on it if it is really to be appreciated. With that in mind, we are pausing for a break with the aim of reaching Wells tomorrow. Enjoy your evening.